As many of you may know, I've been working with golden eagles since the 1950s when I discovered their dead bodies rotting near poison bait stations set out for coyotes. I also began banding baby eagles in the early 1960s, along with a wide variety of other raptors when I was approved by the US Fish & Wildlife to possess a Master Bander's permit. Four years ago, while helping conduct a statewide golden eagle survey with the Oregon Eagle Foundation, I received a phone call from the USFW Bend office regarding an eagle that was nesting above a house near the River's Edge Golf Course in Bend. The woman there was concerned by how much of a mess the eagles were making dribbling gopher guts on her car and pooping all over her house. I made a visit, and sure enough there were two golden eagles, one of them with juvenile markings, conducting themselves in a very un-neighborly manner. However, when we checked the so-called "nest," we found it was only a dead, broken limb supporting a pile of pine needles. We briefly explained to the home-owner explaining that the eagles would be leaving soon, as their food source—tasty marmots and dessert-like Belding's ground squirrels—would soon be going into hibernation. They did, but then the next spring Dr. Joyce Carnes of the Bend Brosterhous community called me. "Jim," she said, "There are two eagles out by my place building a nest." On my first visit, though, all I observed were two red-tailed hawks building a nest in a pine tree adjacent to her property. "You're all wrong, Jim," Joyce lambasted me, "I know a golden eagle when I see one!" I returned a few days later and, sure enough, there were two golden eagles, not "building a nest," but in the act of kicking the resident red-tails out and remodeling the nest for themselves. The unbelievable part of this was that one looked like a juvenile and the other an adult. Yep, it was "them" again. Throughout the summer, they continued refurbishing the nest then left for the winter—and, again, returned in the summer, which is when they got serious: the female laid an egg and hatched it. 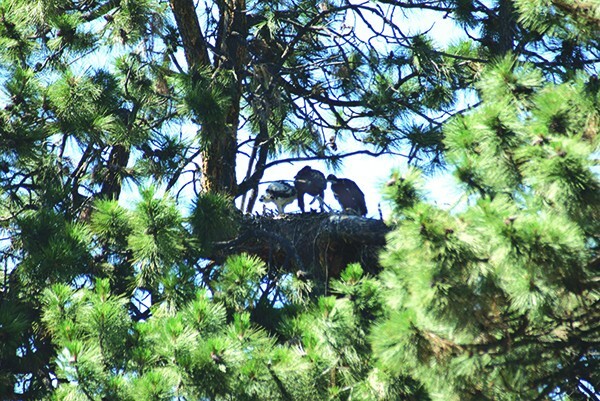 We did not want a whole lot of people knowing that golden eagles were nesting within the city-limits of Bend; think of the dozens of birdwatchers and curious onlookers who would flock to the site invading the privacy of the neighborhood residents and perhaps disturbing the eagles as well. So we kept it quiet, until the nest started falling apart and the downy, partially-feathered nestling fell to the ground and injured its leg. Gary Landers, a raptor rehabber from Sisters took the injured baby eagle home with him to care for and train, the two adult eagles eventually left town, and we all sighed with relief—but not before the eagles caught the attention of Ross Morrison and his wife, Betsy Brown, who live right across the road from the nest tree. Last spring, the two eagles returned and got right to it, building a new nest in the adjacent pine. No fooling around this time, that thing is strong enough to hold up a VW Bug, and strong enough to hold two nestlings that hatched around April. I wouldn't have known anything about it except that Betsy and Ross called me and were glowing like new parents when they told us about "their" kids, and every day since, I've receive ddaily reports from them about the coming and goings of the adult eagles and their babies. But last week, one of the young, named "Whitie" by Betsy and Ross, accidentally fell out of the tree while practicing the fine art of flying in-and-off the nest. It's fully feathered and looks like it could fly all day, but apparently knows little to nothing about actual flying. Whitie (a male, we have since discovered) has been nursed back to health by Jeff Cooney from High Desert Wildlife Rescue and Rehabilitation. Unfortunately, Goldie, the other nestling, fell out of the nest soon afterwards and was found to be in very poor health and is in Cooney's care. Those of you who live within a half-mile of the breeding territory can expect a young, inexperienced golden eagle to drop in on you at any unknown moment. If you have a dog, please keep it under control if the eagle is perched on the dog house roof. If you have a cat, get it into the house (where it belongs) in the event Whitie is hungry. Above all, please have patience! As far as I know, no other golden eagle pair has ever nested within a city limits in Oregon; this pair is setting a precedent. They're also presenting a dilemma. Do we let them stay and figure out a way to deal with their attendant challenges every year? Or do we try to relocate them to a more suitable natural habitat? Should Whitie land on your property, please feel privileged. 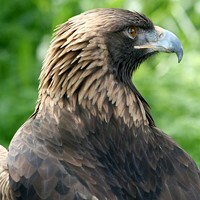 How many people do you know who have a wild, golden eagle stop by to rest? Mom and dad should take him on his way soon after he arrives. If, however, they stop by with a jackrabbit and proceed to dribble rabbit guts on your deck or car, just take a photo of the awful offal, then wash it off with soap and water and send the photos to family and friends, telling them about your role in getting Whitie to fly free. Here are some phone numbers to call if you have a visit and things begin to go wrong, or you want to share: I'm at 541-480-3728; Jeff Cooney with High Desert Wildlife Rescue can be reached at 541-693-3416; Jerry Cordova of USFW at 541-215-5625 and Simon Wray of ODFW at 541-318-1955.